I came to Doctor Devi a year ago with sinus headaches, shortness of breath, coughing, runny nose and wheezing. Within the first two months, my sinus headaches were reduced by almost 90 percent. The coughing and wheezing are virtually all gone. Now, we are working on eliminating allergy symptoms. I have been very pleased with her treatment and I have recommended her to many others. Dubai: Regular sneezing, runny nose, nasal congestion, itchy eyes, cough, and headaches — these are just symptoms of allergic rhinitis which affects one in three adults in the UAE. But beyond these symptoms lie burdens patients carry, and the numbers of affected people are projected to increase, doctors have warned. Around the world, an estimated 400 million people are affected by this disease. And by 2020, a recent study predicted that one in two people up to 14 years of age worldwide may be affected. The term “rhinitis” is used to describe nasal inflammation that results in rhinorrhea (colloquially known as “runny nose”), congestion, nasal itch, sneezing, postnasal drainage, and in some patients, ocular symptoms such as watering eyes. It represents one of the most frequently encountered chronic conditions for which medical care is sought. Allergic rhinitis takes two different forms seasonal and perennial. Symptoms of seasonal allergic rhinitis occur in spring, summer and/or early fall and are usually caused by allergic sensitivity to pollen from trees, grasses or weeds, or to airborne mold spores. Other people experience symptoms year-round, a condition called “perennial allergic rhinitis.” It’s generally caused by sensitivity to house dust, house dust mites, animal dander and/or mold spores. Underlying or hidden food allergies are considered a possible cause of perennial nasal symptoms. Some people may experience both types of rhinitis, with perennial symptoms worsening during specific pollen seasons. As will be discussed later, there are also other causes of rhinitis. 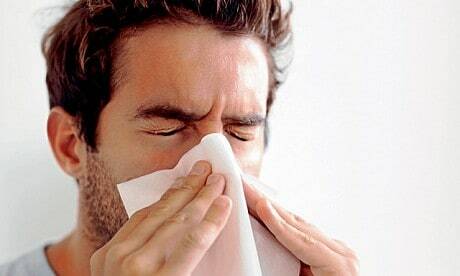 Allergic rhinitis may occur only occasionally, after contact with allergens from food or animal hair. Allergic rhinitis that always occurs at a certain time of the year, as a result of reactions to the pollen of trees, grasses or weeds, is called seasonal rhinitis. If allergic rhinitis occurs throughout the year, it is called non-seasonal, and it is most likely caused by house dust and dust mites. Some known complications include ear infections, sinusitis, recurrent sore throats, cough, headache, fatigue, irritability, altered sleep patterns and poor school performance. Occasionally, children may develop altered facial growth and orthodontic problems. 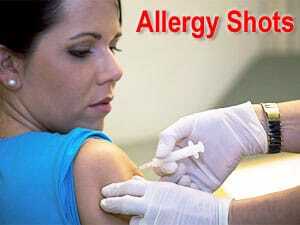 Allergy treatment can eliminate or alleviate most of these problems. These are commonly available over the counter. The medication stops the release of the chemical histamine. They usually effectively relieve symptoms of runny nose, itching, and sneezing. However, if your nose is blocked they don’t work. Newer antihistamines are less likely to cause drowsiness than older ones – but older ones are just as effective. These sprays treat the inflammation caused by hay fever and are safe and very effective long-term treatment. Most patients may have to wait about a week before experiencing any significant benefits. 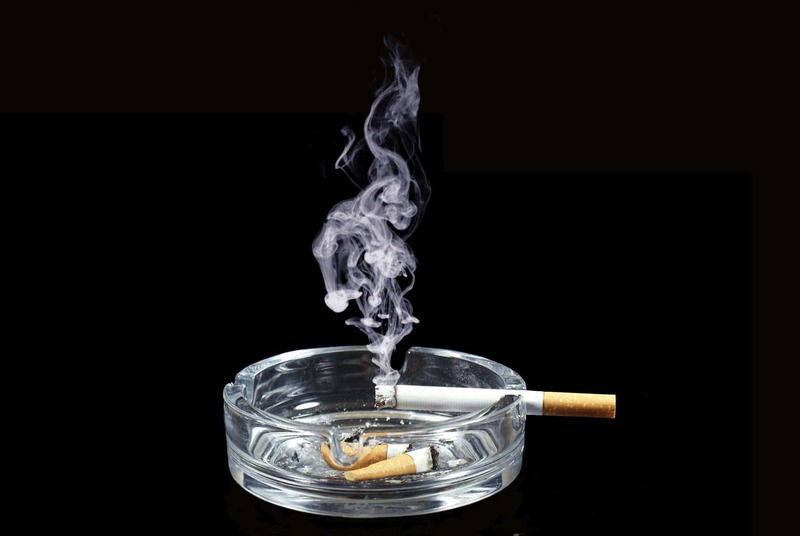 Some patients may notice an unpleasant smell or taste and have nose irritation. Allergic rhinitis is not a serious and difficult disease, but it significantly affects the quality of life and can cause a number of other problems: fatigue, irritability, difficulty in social relationships. You can help yourself by avoiding allergens. In case of pollen allergy, one should follow “allergic prognosis”, in the case of high concentration of pollen our advice is to reduce going out (morning, evening), close the windows, and ventilate the room in the afternoon. Face masks do not help, because they become wet so that pollen particles stick to them. In case of allergies to dust mites or house dust one should remove carpets and other “collectors” of dust, reduce the humidity in the rooms where you are staying, use antiallergenic bedding, and maintain it with special detergents and dry it quickly. There are very powerful vacuums with special filters that prevent the return of allergens into the air. In case of allergy to animal hair, unfortunately, one should avoid being near animals. It is believed that the allergens are actually in their saliva, which is specially retained on the hair. In case of allergy to mold, one should reduce the humidity in the rooms where you are staying, remove indoor plants, thoroughly clean the bathroom and other damp rooms. In the case of food allergies one should check the content of the food that is eaten, and also the declaration of the product since larger amounts of preservatives and colors also cause allergic reactions. Non-allergic rhinitis is an extremely frustrating sinonasal disorder that is characterized by all the same symptoms of sinusitis and allergies, but NOT due to sinusitis or allergies. 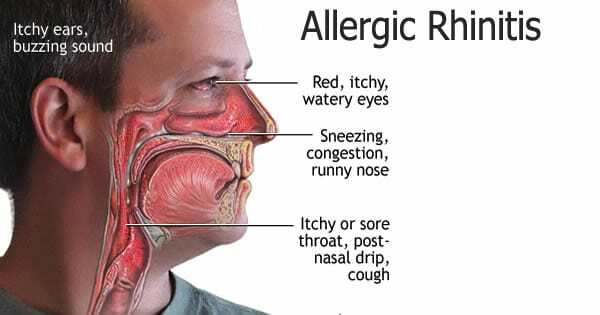 Rather, I consider non-allergic rhinitis to be the over-sensitive nose syndrome whereby breathing in air containing particulates (whether smoke, perfume, dust, pollen, etc) PHYSICALLY irritates the nose causing symptoms. Hormonal changes. Women and especially pregnant women can experience non-allergic rhinitis as a result of hormonal changes. Infections. A common cause of nonallergic rhinitis is a viral infection – a cold or the flu. This should clear up within 2 weeks. 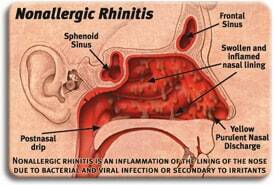 Infectious rhinitis can become chronic, and usually includes a sinus infection – chronic rhinosinusitis. Over-use of nasal decongestant sprays (oxymetazoline) can cause rebound nasal congestion – “rhinitis medicamentosa”. Nasal Polyps. These are benign growths that develop from the nasal and sinus lining. These can block sinus openings and even obstruct the nasal airway, making it difficult to breathe. An Otolaryngologist (Ear, Nose & Throat Doctor) should evaluate growth in the nose or sinuses. Chronic rhino-sinusitis (CRS). Prolonged swelling of the nasal and sinus lining can block the sinus openings, increasing the risk of developing sinusitis. 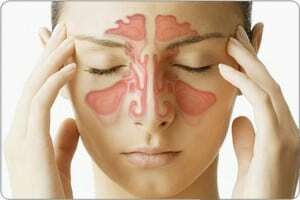 Sinusitis lasting longer than 3 months is considered “chronic sinusitis”. It is nearly always associated with chronic rhinitis too, and the term chronic rhino-sinusitis has been adopted by experts. 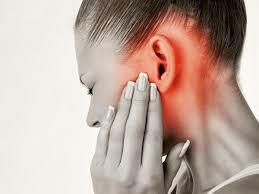 Ear Infections. Chronic swelling of the nasal lining tissues (mucosa) is often associated with inflammation and swelling of the Eustachian tube lining as well. Dysfunction of the eustachian tubes will result in middle ear infections – otitis media. Decreased quality of life. 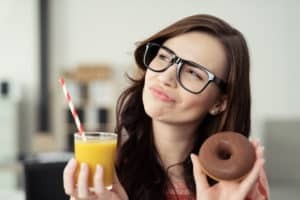 Chronic rhinitis, or CRS, have been shown to severely and negatively impact the quality of life – as much or even more than other chronic diseases that we think of as severely affecting the quality of life: diabetes or heart conditions. Non-allergic rhinitis, or vasomotor rhinitis, describes a group of other causes of rhinitis, with symptoms not caused by infection or allergy. Many people have recurrent or chronic nasal congestion, excess mucus production, itching, and other nasal symptoms similar to those of allergic rhinitis, but the disorder is not caused by the allergy. Some people are very sensitive to sudden changes in weather or temperature. Skiers often develop a runny nose, but in some people, any cold exposure may cause a runny nose. Others start sneezing when leaving a cold, air-conditioned room. 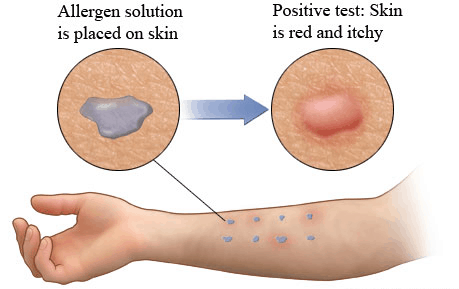 These factors are not allergens, do not induce the formation of allergic antibodies, and do not produce positive skin test reactions. Occasionally, one or two positive skin tests may be observed, but they do not match with the history and are not relevant or significant. If your rhinitis is believed to be caused by a medication you’re taking, such as beta-blockers, your GP may be able to prescribe an alternative medication to see if it helps to reduce your symptoms. 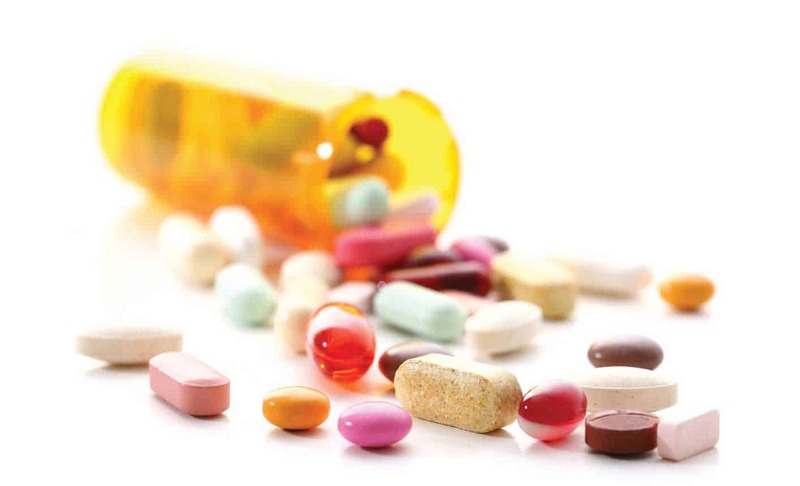 Don’t stop taking any prescribed medication unless advised to by a doctor. Some cases of non-allergic rhinitis are caused by overusing nasal decongestant sprays. In these cases, the best treatment is to stop using these sprays. However, this can be difficult, particularly if you’ve been using them for some time. It may also help to rinse your nose using a saltwater solution (see below) and take antihistamine tablets that cause drowsiness to reduce night-time congestion and help you sleep. Many of these sprays can be bought over the counter in pharmacies without a prescription. Therefore, it’s important to check the leaflet that comes with them before use, because they’re not suitable for everyone. Rhinitis is common. It can affect anyone of any age although it affects adults more commonly than children. It is becoming increasingly common in older people. Many people with persistent rhinitis say they have a persistent cold. However, colds are due to viral infections and normally only last a week or so. Persistent rhinitis is not due to an infection. 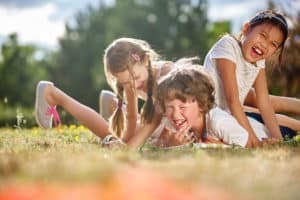 Allergic rhinitis (be it hay fever or persistent rhinitis) tends to run in families. You are also more likely to develop allergic rhinitis if you already have asthma or eczema. Equally, if you have allergic rhinitis, you are more likely to develop eczema or asthma. The conditions of asthma, eczema, and allergic rhinitis are known together as atopic conditions or atopy. A tendency to atopy can run in families. How do you know what kind of rhinitis you have? Consult your physician. Sometimes several conditions can coexist in the same person. In a single individual, allergic rhinitis could be complicated by vasomotor rhinitis, septal deviation (curvature of the bone separating the two sides of the nose) or nasal polyps. 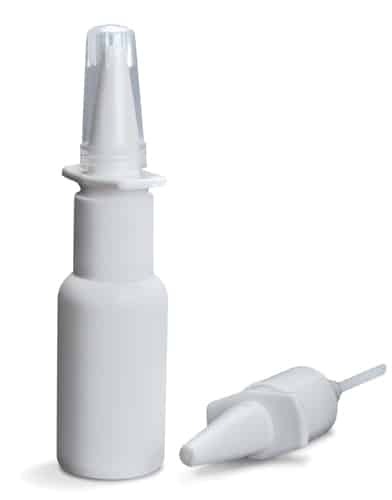 Use of spray decongestants for chronic sinusitis, septal deviation or vasomotor rhinitis may cause rhinitis medicamentosa. Any of these conditions will be made worse by catching a cold. 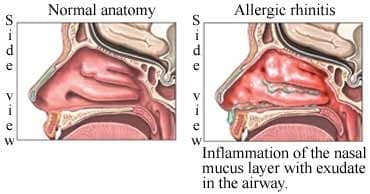 Nasal symptoms caused by more than one problem can be difficult to treat, often requiring the cooperation of an allergist-immunologist and an otolaryngologist (ear, nose and throat specialist). Most people suffering from Rhinitis feel better in warm, sunny weather because cold, damp weather patterns frequently cause the patient to feel chills. As a result, most of them require more bedding and warmer clothing. Rhinitis may also be caused by other substances including house dust, cigarette smoke, strong perfume, chemical sprays, household cleaning chemicals, occupational dusts (such as flour, silica, cement and metallic dusts, industrial dust), chalk powder, marker-inks, coloring crayons, newspaper, copying paper, recycled paper, newspaper-ink, house-paint, water and oil-based paints, crude oil, formaldehyde, cosmetic agents, soaps, perfumes, and other chemical agents. 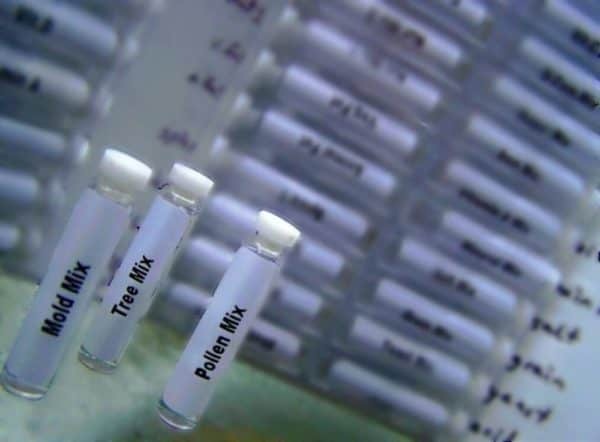 By clearing all your environmental, heavy metal and food allergies from the NAET protocol, we strengthen the immune system, improve digestion and absorption. This allows the body to get the necessary nutrients, which are essential for life. without causing any reactions. NAET evaluation may reveal energy interference in the lung, stomach, spleen, and large intestine meridians. Allergic rhinitis can be eliminated in most cases when the allergens are identified and desensitized through NAET. I suffered from hay fever since the age of twelve, ever since I moved to Norwalk, California. Dr. Devi treated me for my allergy to yeast, pollens, grasses, flowers, perfumes, and mold. I have been totally symptom-free for the past 13 years. 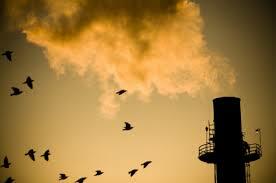 Good day here, just started to be familiar with your article through yahoo, and found that it is very interesting. I’ll be grateful for if you maintain these. Thank you for your comment 🙂 . 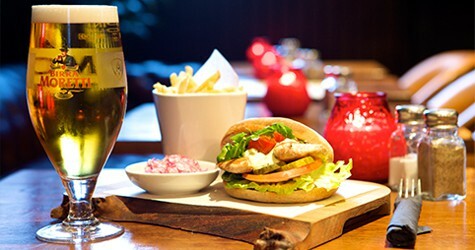 Feel free to contact us if you need any further information. Please don’t forget to subscribe to our blog and you will receive mails once we published new blogs. Tremendously enlightening highlights you’ll have remarked, many thanks for posting. Really entertaining knowledge you have remarked, thank you for putting up. Thank you for your comment 🙂 . Please don’t forget to subscribe to our blog and you will receive mails once we published new blogs. Feel free to contact us if you need any further information. Cheers! Hi Delmar, thank you so much for visiting and commenting to our blog. Please don’t forget to subscribe to our blog and you will receive mails once we published new blogs. Feel free to contact us if you need any further information. ??? ?